Tech Talk | Two cultures, one mind. Another month, another Apple product makes its way into my life. This time it’s the new and improved Apple TV. The heart of the diminutive little black box (think the size of a couple of packs of John Player Specials, and that includes power supply and 802.11n wi fi is one word, streaming. Want to rent a movie from the iTunes store and stream it directly to your tv? – check. Want to stream YouTube, podcasts, flickr and Internet radio from the Internet? – check. Want to stream music, photos, podcasts, photos, and all those movies that you have legally bought from the iTunes store (plus any others that you may have acquired and are in the right format for viewing in iTunes) – check. Yes, there are other products which do similar functions without the tie-in to apple and it’s DRM. And the UK version is lacking some major features which it’s US counterpart have, including the ability to rent TV episodes, and a Netflix-type service opening up the concept of movie rental packages rather than one off rentals (which at £2.49 – £4.49 a pop is anything but cheap). And I can’t avoid mentioning after a recent journey to the states has reminded me, $99 is about £62, even with 17.5% VAT the equivalent price is £72.85 – this for a lower functioned device too. But am I happy with Apple TV? Delighted. Though as has been pointed out I do now own every category of Apple device in at least one form or another (iPods, iPhone, iPad, MacBook, Mac, Apple TV). Maybe this won’t be a completely unbiased view. I’m tapping this on my iPad on my way back from London, a quick ‘in and out’ to see a musical. Interestingly this Virgin Pendolino can get me from Central London to Lichfield in 1hour 11minutes, not that much slower than the new High Speed 2 Rail line Is predicting speeds. It was inevitable that I would get an iPad, not so much if, but when? Fortunately (in a way) it was my 40th birthday year, so my beloved parents decided that a 32gb wi-fi model would be an appropriate gift. It is a brilliant device. Just about the right size, and any criticism about it being ‘too heavy’ has to be countered by the fact that its battery life is measurable in days, not hours. I fully charged the device on Saturday evening, Monday evening with a *lot* of usage over the last couple of days I still have 41% usage as it type. The touch screen keyboard is suitable for touch typing, and is larger then my eee PC. Downsides? It’s still running the previous version of iOS, version 3.x (which I could check if I had a multitasking OS such as iOS 4.0). But an update is coming ‘soon’ according to Apple, and as long as the performance and battery life issues with iOS 4.0 on my iPhone 3GS. One thing to note for early adopters, the iLife applications, Pages, Numbers and Keynote have been reduced in price from £9.99 to ‘just’ £5.99, a relative bargain. I’ll write more about the exciting changes at work in a post later this week, in the meanwhile if you have to beg, borrow or steal the cash to get an iPad. I have somewhat fallen out of love with my little eee PC. Looking back through my blog, the clues were there a while back. I never really did get over the performance blips at the time, and over time it became slower. I did, over Christmas, spend a lot of time looking at alternative Operating Systems, but all of them needed me to scrub the XP systeem. If I was the only person to use the machine this would have been fine, but I had to think about the legacy of the machine, there’s a chance that this will be handed down to someone else, and there’s no chance that they would cope with a non-windows machine. I removed all google software, including notifier, gears, chrome and google earth. (Nearly) all microsoft software went too (yay!). iTunes and Quicktime went into the recycling bin. The only software installed on the machine is IE 8, Twihirl (and the associated Adobe Air framework), and Glary Utilities. I have all the other applications I would need on a laptot via PortableApps.com siting on an 8 gig memory card, which has recently been upraded and contains everything I need (apart from a twitter client, come on guys!). A few other tweaks, I’ve gone into the performance settings through my computer and adjusted for best perfomance, though have kept font smoothing on, as the screen does not look ‘right’ otherwise. I’ve got boot up speed from turning on, to opening Internet Explorer (FireFox runs off the memory card so it a little slower) to a little under two minutes – not bad and I reckon about half the time that it was creaking along. So, new life in a machine without installing the OS, and I’m using it now to type this posting. So go on, love your laptot… at least until the iPad prices are released! I’ve been a bit gadget-strapped recently, try as I might I can’t get excited about blinds and other essential items which I’ve been splashing out on recently. However, I have just succumbed. I love my netbook, but not having a CD or DVD drive is a real inconvenience if you want to just take a DVD away with you, or install software which comes as a .iso file, or traditional DVD. So after some debating, I treated myself to the Liteon ETDU108-02 8x External Slimline DVD ROM (Black), delivered in great time by Amazon even with their Super-Saver delivery (are Royal Mail trying extra-hard post strike, it certainly feels like it at the moment. There’s a review from the register here, which seems to criticise it for not being able to write CDs and DVDs. No it doesn’t, and I looked and on Amazon there are similarly priced portable drives which does offer this functionality, but this is a cheap and cheerful solution to a specific problem. And does it work? Brilliantly. I had major reservations that it wouldn’t work with my underpowered eee-701, which has sometimes struggled to play back .mp4 files when running full screen, but DVDs run fine when using VLC. The other reason for purchase, it’s sometimes handy to be able to burn a CD/DVD, whilst watching another when on my MacBook or Big Mac. A DVD project can sometimes take nearly four hours to encode and burn (I’ve got one running as I type). 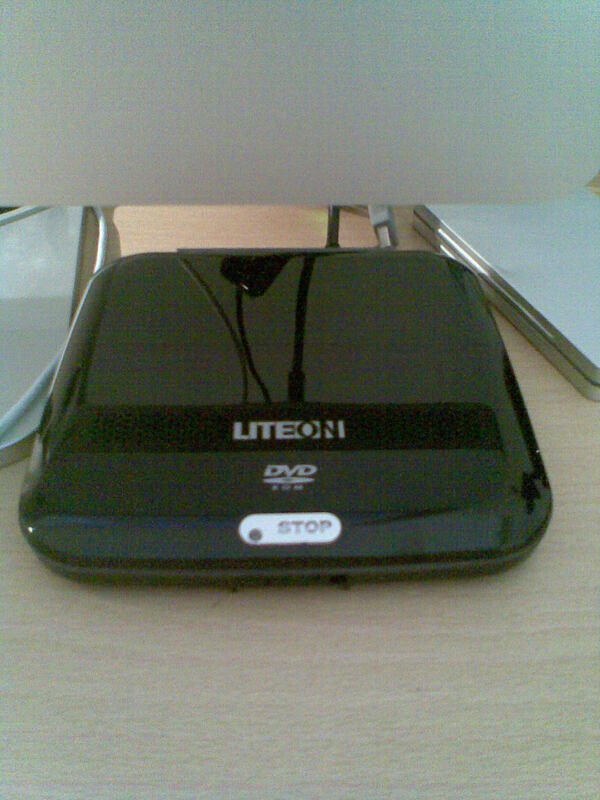 I can now plug in the Lite-On, and carry on watching a DVD. The build quality seems good, with a big panic ‘stop’ button on the front. We take it for granted nowadays that these products just work out of the box, no need to install drivers etc. The only thing missing is a case of any sort, for a device that’s going to be used on the go this is a serious omission, and I may invest in some sort of case offering more protection than the plastic bag which it’s currently stored in. So, a completely unnecessary gadget purpose, but something which I’m pleased with, and seems to do exactly what it should. In the early hours of the morning my Wii started glowing a bright blue. That rare event, a message from Nintendo. The BBC iPlayer channel is now available for free on the Nintendo Wii. Now downloaded, it takes pride of place at the front of my channel list. 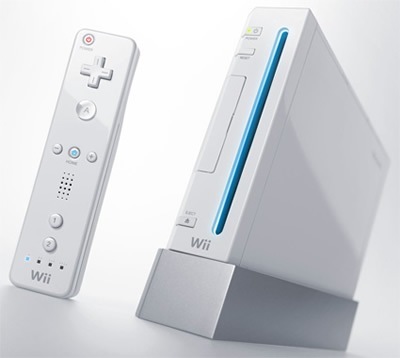 If you’ve installed a few other channels or games, you may find that it’s installed on ‘screen two’ of the Wii menu. Clicking buttons A and B together allow you to reposition the channels, making accessing the iPlayer a three-click process (one click to turn Wii on, one click to select Wii channel, one click to select Start). The channel itself is available for free from the Nintendo Shop online. It’s stating the obvious of course but your Wii does need to be connected to the Internet. (That feels a little like the statement that Microsoft had to release to say that you needed a PC to be able to install Windows 95). A very short time later, you then have is the complete BBC iPlayer service, both video and radio available to you in full screen glory. The interface is great, and a huge improvement over the old channel via Nintendo’s internet channel (which ‘broke’ early September after an upgrade to the Opera browser). A new home means faster broadband for me, so the stuttering and drop-outs I used to experience have disappeared. Full screen video looks great, and is equal to my ‘standard definition’ tv picture. Sound is a little ‘flatter’ compared to normal tv, but nothing that you wouldn’t notice. What makes the Wii the ideal media player of course is that it’s virtually silent in use – certainly compared to my new Xbox 360 Arcade (see, I have been busy with the occasional gadget purchase whilst I’ve been away). Whilst this isn’t the *only* reason to buy a Wii, I’ve been rarely so impressed by a piece of software – it’s been a long time coming, but well worth the wait. More info on the launch here. Regular readers to this blog will be holding their hands up in despair now. Surely he can’t justify another gadget to add to his bulging rucksack. Hang on though, it can’t be argued that I don’t actually use these gadgets. As I type this on my eee in Cafe Nero, using my 3 wireless broadband and listening to music on my iPod touch, it can never be said that I’m not connected. Anyhow, thoughts have recenty turned to my holidays, and the need to carry enough books to sustain me through at least two weeks of sun and surf. For some people this could be a single novel, but not me. For my last holiday I took eight books and read seven of them, but then I had the luxury of a huge people carrier to take my books (or my MINI, with the back seats down). This year though we’re flying, so that means a ridiculously low baggage limit. How am I to get all my reading into a small case? Enter e-Readers, the next ‘must have’ accessory. I was somewhat pleased to note that I wasn’t the only person who’s been thinking of these too. The Sony e-Reader pretty well has the market sown up, but that may be about to change. CoolerBooks is that rarity, a UK-based company (based in Reading, where else!) which is planning on releasing an e-book reader using the same e-ink technology used in Sony products, but at a lower price point. The key technology is e-ink, which as far as I can tell works like a very fancy etch-a-sketch, once power has been applied for you to switch pages, then no power is needed to maintain the screen image, meaning that thousands of pages can be read between charges. The light weight and small size all helps towards it’s portability, as does changing the font size. So I’m waiting until their product launches in the UK (soon I hope, I’ve set myself a 1st July limit for this), so I can do a proper side by side comparison, at least on paper.